The clever Roman engineers devised a retractable awning system they called The Velarium with Tension Exterior ZIP Shade. Constructed nearly 2000 years ago, this covering was a very effective engineered shading solution that protected the spectators from the unforgiving summer sun. In today’s world, creating horizontal shading systems is always a challenge as we try to treat skylights of all shapes and sizes. That is because Architects are creating new ways of increasing daylighting into our living spaces. However, with all this natural light comes excessive solar heat gain and annoying glare. To manage this, window covering engineers must provide well-designed skylight solutions with tension zip shade. 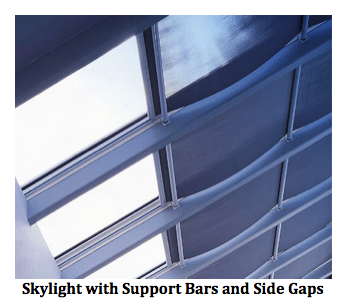 A common system fabricated by many is the tensioned double roller skylight shade. While this works fine, there are several downsides. 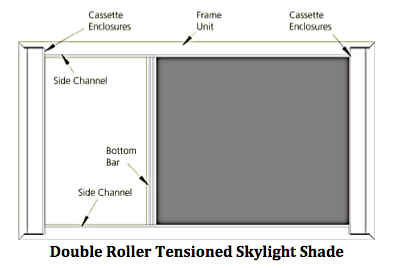 The double roller skylight shade has a roller at each end housed in an enclosure. One roller has the motor, the other houses a spring that provides the tension so the fabric remains taught. This works fine with small sizes. However, once the opening becomes longer then the tension cannot keep the fabric from sagging, so permanent support bars are added. There is also the problem of gaps at each end, unless side channels are installed. 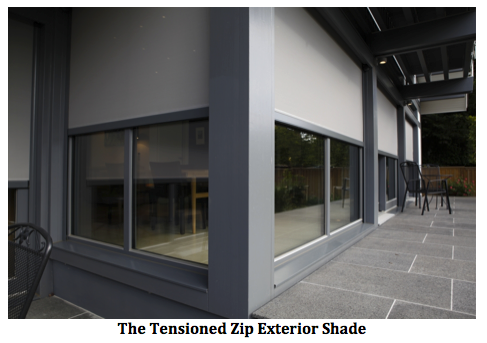 To understand what the Tensioned Zip Exterior Shade is, let me first explain a Zip Shade. The Zip shading solution is manufactured with a “zipper-like” detail welded to the vertical edges of the fabric. 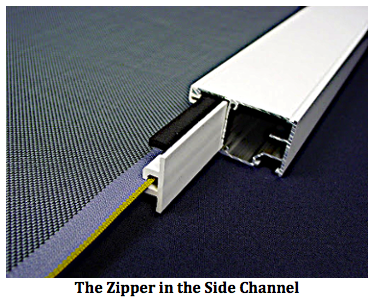 These zippers run in tracks on each side and in turn prevent the fabric from falling out or being pushed out of the aluminum side channels. In order to keep constant tension on the fabric, there must be a way to pull the fabric taught. On the double roller system, this is done with a spring, as shown previously. The Tensioned Hembar eliminates the need for the fixed roller with the spring. Instead the Hembar provides the tension. This works well for many applications especially as a skylight or a bottom up shade. Once we add the Zip feature, we now have an engineered shading solution that needs no fixed support bars to prevent sagging and only one roller for the shade rollup. The result is a clean, elegant and reliable skylight system that can use with a mesh or blackout fabric. 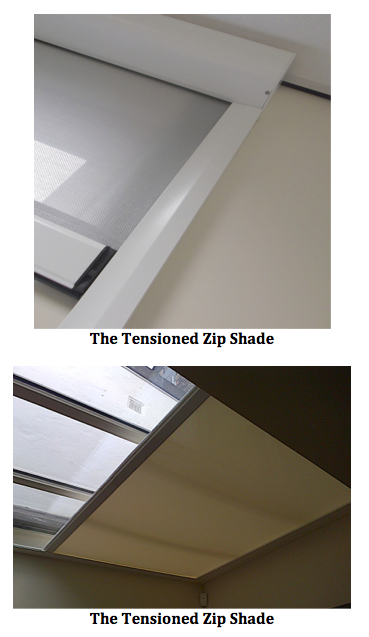 The Tensioned Zip Shade is an engineering breakthrough. Not only can it be used to cover skylights, this system also works well as a bottom up shade. In addition to the various interior solutions, this product is also suitable for exterior installations.